The democratic opposition in Cuba predates the Castro dictatorship. It came into being on March 10, 1952 in reaction to General Fulgencio Batista's coup d'état against Cuba's democracy. The movement was divided between those who sought regime change through the remaining institutions of the republic and attempted to engage Batista in a civic dialogue and those who took up arms in an armed struggle. Batista's intransigence to leave power through the dialogue process made armed resistance more attractive. However, the military was corrupt and lacked fighting spirit and this meant that armed resistance could succeed. Fidel Castro's rise to national prominence was predicated on restoring the pre-existing democratic order using violent means and received support from Cuba's last democratically elected president, Carlos Prio Socarras. The consolidation of power, with the assistance of the Soviet Union and the East German intelligence service into a totalitarian communist dictatorship was a rude shock to many compatriots of Fidel Castro who had fought alongside him to remove Batista from power. For example, President Carlos Prio Socarras who had backed Castro against Batista and returned to Cuba in 1959 in a short period of time understood that a democratic transition was not taking place went back into exile and in opposition to Fidel Castro. Many others who had fought in guerilla actions against Batista went back into the hills of the Escambray in an anti-Castro guerilla struggle that continued throughout the 1960s. The Castro regime with Soviet and East German advisors overhauled the military and installed a disciplined fighting force. By 1962 there were more than 40,000 Soviet troops in Cuba. Following the Cuban Missile Crisis Fidel Castro also employed former Nazi Waffen SS to train Cuban units and the Cuban dictator purchased weapons from the extreme right in Germany. The democratic armed resistance to the Castro dictatorship, mainly based in the Escambray mountain range in central Cuba was eventually crushed, but it took six years and the forced transfer of thousands to accomplish it. Julio Ruiz Pitaluga or "Pita" to his friends had risen to the rank of captain in the July 26 Movement in the struggle against the dictator Fulgencio Batista. Like other rebels against Batista rule, after years of struggle he had to go into exile, but returned in 1959 with the end of the dictatorship. Only to find that his July 26 compatriot Fidel Castro was now forging a new and more brutal dictatorship. Pita joined together with Bernardo Corrales and other comrades in the struggle against the Batista dictatorship to now oppose the emerging Castro dictatorship. Pita was imprisoned and sentenced to 30 years in prison for his opposition to the Castro regime. He spent 23 years of his life in prison in Cuba as a political prisoner then refused to leave the island when released. Until his dying day he kept resisting and denouncing the dictatorship of the Castro brothers. Pita lived on 11th street between D and E avenues in the neighborhood of Lawton in Havana, Cuba. He died in Cuba in 2011. I'll return to him later. Within the dictatorship itself arose dissidents such as Martha Frayde, who was Cuba's representative to UNESCO in Paris until 1965 when she returned to Cuba and began to dissent from the Castro regime's slide into totalitarianism. Together with Ricardo Bofill she was one of the founders of the Cuban Committee for Human Rights in 1976. Bofill in an August 2008 interview described how he, Martha and Eddy Lopez in Martha Frayde's home signed the founding document establishing the Cuban Committee for Human Rights. She was jailed in 1976 and sentenced to 29 years in prison for her criticism of the Castro dictatorship but released into exile in 1979 following a campaign of international solidarity. In 1989 she founded the Spanish section of the Cuban Committee for Human Rights and remained an active member until the end of her life in December of 2013. This organization successfully documented and exposed the systematic violation of human rights at the United Nations Human Rights Commission in Geneva leading to the Cuban dictatorship's condemnation. The political and economic reality of the Castro regime in 2014 is that it is a totalitarian military dictatorship that maintains political and economic control of Cuba. The regime elites are wealthy and want to maintain their status and look to China, Russia and Vietnam as models. At the same time the deterioration of the infrastructure, endemic corruption, cronyism, and rising expectations of change with the expected death of Fidel Castro threaten its survival. Imagine for a moment growing up in a totalitarian dictatorship. What would drive you to stay and resist what has been in complete control for decades? Oswaldo José was born on February 17, 1988 and the Christian Liberation Movement (MCL) came into existence that same year on September 8, 1988 on the Feast Day for Cachita, Our Lady of Charity. The founding of the Christian Liberation Movement began a new phase of nonviolent civic struggle for national reconciliation. In March of 1990 Oswaldo is detained for several days and interrogated by the political police of the regime and threatened that if he continues his nonviolent civic struggle that he would face several years in prison. Following his release from detention Oswaldo Payá and the MCL make public a "Call to a National Dialogue" among all Cubans inside and outside the island. The movement begins a campaign to collect 10,000 signatures, with the intention of giving this citizen’s initiative the status of a Bill covered in Article 86 of the Cuban Constitution in force, before it was partially reformed in 1992. "This March 15, 2010 marked the 20th anniversary of my imprisonment by the dynastic government you lead. I was 25 years, five months and 15 days old on March 15, 1990 when I declared myself to be an opposition activist and demanded democratic reforms; it took another 17 years for me to be released. I will never forget how during that time the sinister units of the political police physically and mentally tortured me, and tried in vain to break my dignity in exchange for releasing me or making my prison term more comfortable." On May 10, 2002, representatives of All United, led by Oswaldo, turned 11,020 signatures of electors into the National Assembly of Popular Power, in that way turning Project Varela into a bill under the prevailing Cuban Constitution. This obliged the Assembly of Popular Power to publicly discuss the Varela Project and to vote in favor or against it. Furthermore, the government was obliged to promote a public discussion of Project Varela in the mass media that it controlled (and still does). Among the activists who signed the Varela Project and joined Oswaldo in turning in the petition signatures was the old democratic resistance fighter, Julio Ruiz Pitaluga, who said: "I've waited 42 years to see this." Instead of following its own own laws and regulations the Cuban government’s response was to organize its own petition drive to make the “socialist” aspect of the current Constitution untouchable. This supposed law was presented and approved by the Assembly in violation of its own regulations, since the Varela Project by precedence should have been considered first. 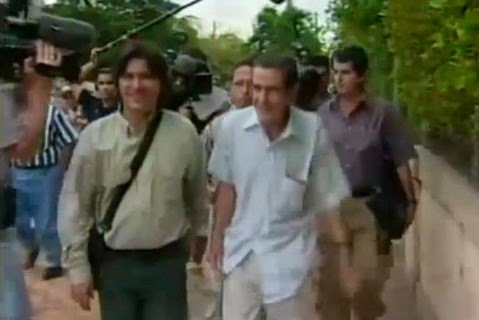 Then on July 5, 2002, the Assembly “indefinitely” suspended its ordinary session to avoid discussing the Varela Project. The regime also responded with acts of repression and intransigence against members of the civic, nonviolent movement — but project Varela organizers continued to collect signatures and the civic movement grew. The Castro regime responded to the growth and dynamism of the civic movement on March 18, 2003, with the beginning of the Black Cuban Spring. Over a 100 activists were detained and seventy-five were sentenced to prison in show trials with sentences ranging from twelve years up to twenty-eight years in prison. More than forty of the imprisoned activists had worked on the Varela Project. The Ladies in White, led by Laura Pollan, became a nationwide movement that with regular street demonstrations pressured the dictatorship to release their loved ones and challenge its wholesale violation of human rights standards. The movement achieved its aim of obtaining the release of the 75 Cuban prisoners of conscience imprisoned in March of 2003 between 2010 and 2011, but when Laura Pollan stated that the movement would continue in order to obtain the release of all political prisoners and changes in the law so that there are no more prisoners of conscience in Cuba within weeks she became suddenly ill and died under suspicious circumstances on October 14, 2011, but the group she founded did not falter or disappear. Berta Soler became the spokesperson of the Ladies in White and this movement has continued. Ten months later on July 22, 2012 in Bayamo, Cuba Oswaldo Payá Sardiñas and Harold Cepero Escalante both of the Christian Liberation Movement were killed in an incident that has still not been cleared up and the new information that has emerged points to an extrajudicial execution by the State Security apparatus. Opposition to and frustration with the current system in Cuba is rising. A manifestation of this is the worsening human rights situation; the deaths of opposition leaders; the increased violence; and the explosion in the numbers of arbitrary detentions. This is a battle of wills between a dictatorship that wants to hang on to its privileges and justify the past 55 years of totalitarian rule and a democratic opposition that represents a population that is tired and frustrated with the systematic rights violations and the lack of options in Cuba. International solidarity with human rights defenders and pro-democracy activists will be a critical factor in determining whether the regime will achieve and maintain its succession or whether the democratic opposition will achieve a transition to democracy. The photo at the top of the page taken in 2002 with Regis Iglesias, Julio Ruiz Pitaluga and Oswaldo Payá represents three generations of constant struggle for a free Cuba. Twelve years later and another generation of Cubans have joined the freedom movement. There is cause for hope if not optimism.